The Princess Royal officially opened the £6.5 million extension to Moray College UHI yesterday in front of students and teaching staff. The new Alexander Graham Bell centre is designed to support the ground breaking work being carried out in digital healthcare in the county. 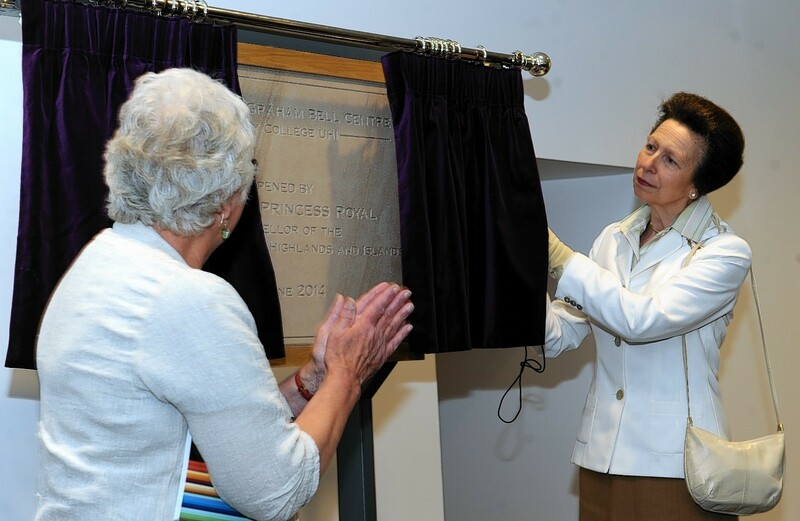 During the ceremony Princess Anne, chancellor of the University of the Highlands and Islands, unveiled a commemorative plaque made from Moray stone. Two children from the Moray College nursery Marci Elliott and Ryan Williamson presented the princess with a bouquet of flowers. Anne Lindsay, acting college principal, said: “What we are really trying to do is bring together NHS technicians and also industry developers and the academia of the university to really drive forward digital health so we can develop products and different services here which the industrialists can market globally. “It will bring jobs to Moray and drive up economic activity. “It’s not that many months ago that it was a building site and students were trying to study around it. The three-storey addition has been sympathetically built on to the existing college campus, which includes the B-listed old Elgin Academy building. The top floor houses a mock ward for training nursing staff, complete with electronically controlled bed hoists and a sink. Neighbouring rooms have been allocated to training in health and safety, resuscitation and minor surgery. NHS Grampian yesterday showcased the work they are carrying out within their training rooms which are located on the second floor. Moray’s MSP Richard Lochhead, who was at the opening, said: “I had the honour of cutting the first sod of turf for the Alexander Graham Bell centre and to see it go from that first cut to the fantastic building we see today is a big achievement. “This is a prestigious academic building using up-to-the minute technology for the excellent conferencing, teaching and business facilities and it is great to have the Princess Royal officially opening the building.